We are a distinctly Christian church committed to whoever crosses our path. Restored relationships through Jesus Christ, friendship, evangelism, discipleship, and service are our primary goals. Biblical flexibility and integrity guide our fellowship. The church started in a classroom and have now move to a lager hall in a school compound as more people are coming to the campaign for Christ. In 2009 the church hosted a crusade in the Eastern part of Freetown the Capital of Sierra Leone in one of the biggest field which accommodated 25 000 people. This open-air crusade was followed by signs and wonders. 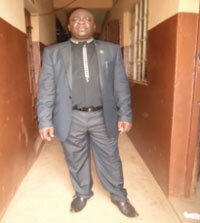 Prophet Valicious Bunting is the Head Pastor and General Overseer of the Fire of Evangelism and Miracle Ministries. Prophet Bunting holds a B.A in Psychology, M.A in Education Psychology, Teaching Diploma in Elementary Education and a Doctorate (Ed. D) in Curriculum and Instruction with an emphasis on Rural Development and an Advance Degree in Theology from the International Christian University, Lagos. For the last 15 years, Dr. Bunting has served as pastor and Associate Pastor in various churches in Nigeria and Sierra Leone where he has established the Fire of Evangelism and Miracle Ministries. Prophet Bunting is an accomplished prophet and spiritual leader. His teaching philosophy bridges the gap between holiness and sanctification with an inclination towards creating a conductive atmosphere for spiritual needs. As a spiritual counselor, he also believes in multiple intelligences and individual differences and the potential to develop people to their maximum potential to glorify our Heavenly father above us.